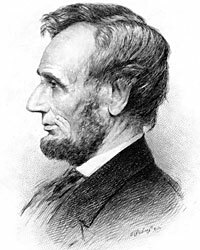 Historian observations of Abraham Lincoln : Dwight Anderson, Herman Belz. Dwight Anderson, Abraham Lincoln: The Quest for Immortality, p. 72-73. Herman Belz, Abraham Lincoln, Constitutionalism, and Equal Rights in the Civil War Era, p. 87-88. Henry B. Kranz, editor, Abraham Lincoln: A New Portrait, p. 38 (Kenneth A. Bernard, "Lincoln the Emancipator"). Gabor S. Boritt, Lincoln and the Economics of the American Dream, p. 282. Lord Charnwood, Abraham Lincoln, p. 184. Richard N. Current, The Lincoln Nobody Knows, p. 10. 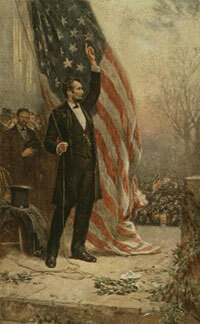 John Patrick Diggins, “Lincoln’s America: Toward a Reinterpretation of American History”, . Don E. Fehrenbacher, Speaking of Abraham Lincoln, p. 101. William E. Gienapp, Abraham Lincoln and Civil War America, p. 51. 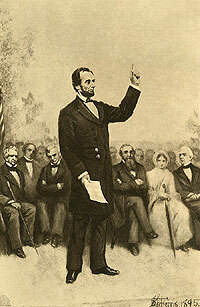 Oscar and Lillian Handlin, Abraham Lincoln and the Union, p. 98. Emanuel Hertz, editor, The Hidden Lincoln, p. 192 (Letter from William H. Herndon to Truman H. Barlett, July 19, 1887). Josiah G. Holland, Life of Abraham Lincoln, p. 193. Richard Hofstader, American Political Tradition, p. 129-130. Harold Holzer, editor, The Lincoln-Douglas Debates, p. 22. Harry V. Jaffa, A New Birth of Freedom: Abraham Lincoln and the Coming of the Civil War, p. 372. Robert W. Johannsen, The Frontier, the Union and Stephen A. Douglas, p. 259-260. Frank L. Klement and Steven K. Rogstad, The Gettysburg Soldiers' Cemetery and Lincoln's Address: Aspects and Angles, p. 140. Philip B. Kunhardt, Jr., A New Birth of Freedom: Lincoln at Gettysburg, p. 60-61. Henry B. Kranz, editor, Abraham Lincoln: A New Portrait, p. 61-62 (Ralph G. Lindstrom, "Lincoln’s Views on Government"). James M. McPherson, Abraham Lincoln and the Second American Revolution, p. 115-116. Ralph G. Newman, editor, Lincoln for the Ages, p. 381-382. Mark E. Neely, Jr., The Fate of Liberty: Abraham Lincoln and Civil Liberties, p. 216-217. Allan Nevins, The Statesmanship of the Civil War, p. 111. Stephen B. Oates, Abraham Lincoln: The Man Behind the Myths, p. 59. James G. Randall, Lincoln the President: Springfield to Gettysburg, Volume I, p. 24-25. William O. Stoddard, Abraham Lincoln: The Man and the President, p. 329. Gabor S. Boritt, editor, The Historian's Lincoln: Pseudohistory, Psychohistory, and History, p. 134 (Glen E. Thurow). Garry Wills, Lincoln at Gettysburg, p. 120.